"You finally remembered, didn't you? I've been keeping it for you. Because it's a valuable memory of yours--"
Age: Unconfirmed; no younger than 25. Anime Biography: The manager of Card Capital, and Misaki's cousin. Shin is the one who initially brings the cast together by holding the shop tournament that leads to Team Q4's formation. While he doesn't himself fight, he knows much about Vanguard and provides moral and strategic support to the kids. Note that while Crunchyroll's subtitles waver in referring to him as Misaki's cousin or uncle, Bushiroad's blog states that during production he was referred to as the nephew of one of her parents. Misaki's parents died ten years ago in a car accident. At this time, Shin was still in high school(his uniform is the same one that Kai wears, indicating him to be at least 15 years old.) He became Misaki's guardian from then on, and the manager of Card Capital until she could come of age to inherit what her parents left behind. Shin appears to have overcome his grief at their deaths, and holds no resentment toward his "promotion" to both parent and manager, but he has difficulty raising Misaki due to being a kid at the time of their passing. Shin is no father, but he does appear to have learned from this experience, and later in the series acts as a parent might while coaching Aichi. Shin eventually arranges a training camp along with Team Caesar, bringing both groups together on a camping trip where they restructure their decks to prepare for the upcoming season. In ride 52 he prompts Team Q4 to again rethink their overall strategy, in order to finally put an end to the Foo Fighters' scheming. Manga Biography: Shin's role is lessened in the manga, where the tournament arc doesn't take place. However, he appears to act as an emotional pillar for Misaki, attempting to get his cold niece to open up to others, and is instrumental in arranging her fight with Aichi. 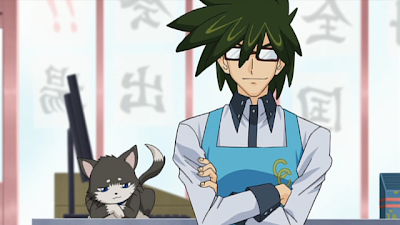 Decks: Shin has not been shown to fight, though he is the one who built Misaki's first deck. In addition to this, he is the primary supplier for Team Q4's card supply.